Search our Campus News Archive by keyword or date below. Click here to view our IWA in the Headlines page. Due to expected inclement weather, several events for the weekend of Friday, September 14, 2018 have either been changed, postponed, or canceled. In this edition of ANGEL eNEWS, read about our upcoming Campus-Wide Mass, Family Fun Fiesta, our second annual AngelTALK, and much more! High School Level students partnered with the Coastal Bend Blood Center to help provide the gift of life for those in need on August 21st. 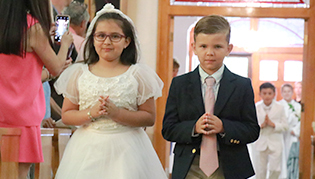 In this edition of ANGEL eNEWS, read about the Middle Level's House Sorting Ceremony, the upcoming Montessori Blessing and Dedication, future college visits, and much more! Middle Level students couldn't wait to find out which house they would be inducted into during the school's House Sorting Ceremony on August 9th. 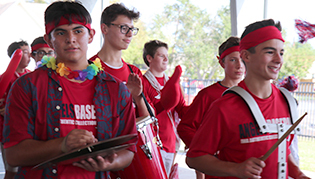 In our first edition of the 2018-2019 ANGEL eNEWS, read about our first day of school, upcoming events, our first parent event of the year, and much more! Important Things to Know for the New School Year! Important documents, resources, and information are available online to gear up for the 2018-2019 school year! School Supply Lists are Now Available! The fall semester will be here before we know it. It's time to insure your Angel has everything they will need to begin the 2018-2019 school year. The updated 2018-2019 Academic Calendar is now available for download in PDF format or electronically on our Campus Calendar webpage. Please encourage your child to read during the summer! Provided are required and suggested reading lists and assignments at each grade level. CITGO representatives presented senior David Pierce with a $16,000 academic scholarship on June 12th. In this Edition: Read about Graduation Ceremonies, Senior Walk, Media Gallery, and more! With a total of 67 students, our graduation class has received over $10.8 million—and rising—in college scholarship offers. In this Edition: Read about Achievement Awards, Crowning of Mary, Summer Camps, and more! IWA is proud to have two seniors sign athletic Letters of Intent during the 2017-2018 academic school year. In this Edition: Read about Decision Day, Teacher Appreciation Week, Summer Camps, and more! Angels welcomed author and Corpus Christi native Diana Lopez to its campus on May 3rdin the school's James R. Dougherty, Jr. Center. In this Edition: Read about our Ring & Rose Ceremony, PSIA Academic Meet, Award Ceremonies, and more! 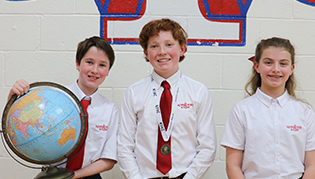 Elementary and Middle Level students recently competed at the PSIA Academic Competition on April 28tth in Fort Worth. Several Elementary Level students placed highly in math and writing competitions on April 21st. Athletes on our varsity track and field team will be headed to regionals after qualifying at the TAPPS 3-5A District Meet. In this Edition: Read about our Campus-Wide Mass, Liturgy of Light, Athletics, and more! The varsity baseball team clutched a 1-0 victory from St. John Paul II High School to become district champions on April 14th. Out of 22 teams in TAPPS 5A, our TAPPS Academic and Speech teams placed third at this year's State Academic Competition. An award banquet was held for our boys' varsity soccer team celebrating another amazing season. In this Edition: Read about the Catholic Classic, Lent, Easter, and more! Angels soared at this year's TAPPS State Music Championships, earning several first class superior ratings. Three High School Level juniors have been selected by the Corpus Christi Sister City Student Exchange Program to travel across the world this summer. In this Edition: Read about Mission Team, the Catholic Classic, Gala, Scholastic Book Fair, and more! Several girls' varsity basketball players have been named 2017-2018 TAPPS All-State and All-District honor recipients.